So, Are you looking for Google Account Manager? Yes? Then, Here we move forward. It’s a hard thing to manage one or more Google accounts on a single Android device. So, The Google Account Manager has been helping the user by handling all the Google accounts at one place. Sometimes, users will face an error which is something called like “Suddenly stopped” or “Parsing error,” for this type of problems, The Account manager app might help to fix the issue. 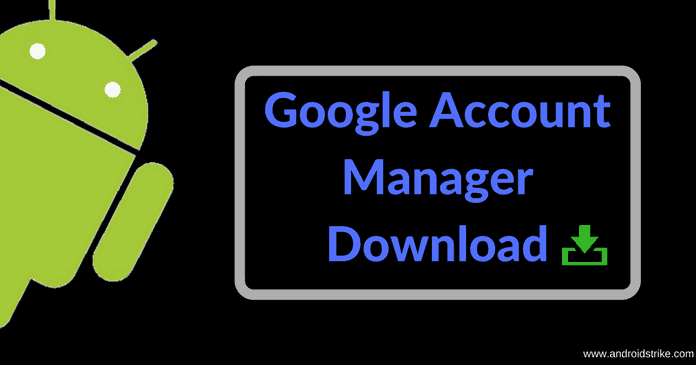 Google Account Manager is the tool which manages and carries one or more Google accounts on a single device. It not only maintains accounts, but It also helps in bypassing FRP (Factory Reset Protection Lock) from an Android device. Actually, This app has been used by many of the Android users to unlock their device from FRP. Because of forgotten account passwords, the phone will be in the locked state. To bypass or to unlock the dead smartphones (bricked) the Google account manager will constantly be used. It can handle one or more accounts. The downloaded Apps and games data will automatically be synchronized when logged into a new device. The inactive Account will be deleted. At very first step, Download the App from the link given above. Now, Go to settings >> Security >> Enable Unknown sources. Now, Select the downloaded app and install it. I hope you loved this article. If you have any problem installing the APK on your device, please let me know in the comment section below. Also, Please do share this article with your friends and let them help with this. Nice post to get the link of App to Download . Excellent!! I read your full content, exclusive presentation about Guide to Download and Install Google Account Manager APK on the Android device, however, Anyway I Know android guile and Install process properly through the read your article. However, I come back again for another Apk Article and share your content with my friends. Thanks Admin. Good Luck! !